As part of its process of reviewing industry Codes of Practice for the Care and Handling of farmed animals in Canada, the National Farm Animal Care Council (NFACC) has released its draft update for the Care and Handling of Hatching Eggs, Breeders, Chickens and Turkeys. The draft is now open for public comment and we recommend you take part as chickens and turkeys need your help now more than ever. Below are the recommendations we will be submitting to NFACC. Feel free to use them to develop your own submission. Click here to participate. Our review of NFACC’s draft Codes of Practice for the Care and Handling of Hatching Eggs, Breeders, Chickens and Turkeys was a difficult endeavour. Many of the current practices in the poultry industry are inherently abusive and cruel. How does one make chicken-catching, artificial insemination or the mindless handing of hundreds of thousands of chicks each day at just one hatchery better? Many practices which have been shown to be egregiously cruel continue to be included in NFACC’s draft codes, causing us to question whether the industry learned anything from its scientific review. Perhaps even greater than this though is the glaring issue of Canada’s lack of on-farm inspections. Exactly who is going to inspect and enforce these recommendations, and if violations are found, what will the penalty be? As has been shown in recent undercover and open investigations, even when clear and egregious cases of horrific cruelty are exposed, the perpetrators and the industry responsible escape unscathed. Will it continue to be the responsibility of non-profit animal protection organizations to investigate and expose what’s happening on Canadian farms for any hope of change? The draft code indicates that “Chicks must never be squeezed, except for the purpose of excreta ejection during sexing by vent examination”. Squeezing chicks is stressful, painful and causes them to vomit. Sexing should be done through the least invasive method (ie wing inspection). The draft code continues to allow all forms of mutilation by all means including microwaving and use of scissors. All mutilations should be forbidden (as they are in the European standards), and should only be allowed if all efforts to prevent feather pecking and cannibalism have been exhausted. In the rare exceptions when they are carried out, painkillers must be provided. The draft code only recommends that mature broiler breeders must have separate feeding areas that allow females protection from males. This should be a requirement, not a secondary “additional recommendation”, as it has been well documented that males will harass and attack females who are simply trying to reach food and water. The draft code recommendation d should be a requirement (“Monitor and manage the incidence and severity of hock burns, breast blisters, and foot pad lesions. These are signs of poor litter.” ) These burns, blisters and lesions are extremely common and steps must be taken to address them. The draft code only calls for 1-4 hours of dark in a 24 hour period. The EU COUNCIL DIRECTIVE 2007/43/EC calls for at least 6 hours of darkness in a 24 hour period, 4 of which are uninterrupted. Canadian industry regulations should at least match this as the European regulations are dated. The draft code requirements are the same as the European standards from 2007, which are now dated. These should be decreased to meet the most recent scientific recommendations of 25 kg/m2 or lower. The draft code’s requirement is vague and unclear (“sufficient” number of nests). Actual numbers are only given in the recommendations and even they seem low (4-7 hens). Nests should be provided for every 2-3 hens. The draft code does not require grass or vegetation. This is only listed as a recommendation. The provision of vegetation should be a requirement. 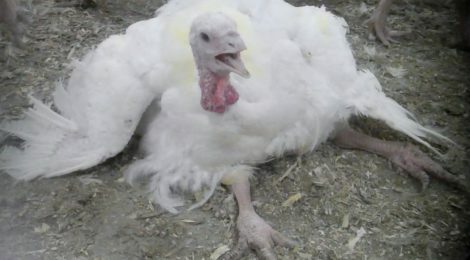 The growth-promotant Ractopamine (used in turkeys under the brand name Topmax) should be prohibited. The draft code only requires that the starvation period does not exceed 48 hours. This should be reduced by at least half and water should never be restricted. The poultry industry must address the issue of genetic selection and choose breeds whose growth rates are not so fast that they compromise the birds’ skeletal and cardiovascular systems. All recommendations in the draft code should be requirements. Flies are an especially large problem in turkey barns and must be controlled. The draft code requires just one on-site visit a day. With thousands of birds in multiple barns, visiting just once a day does not provide sufficient time to check each bird. This should be increased to twice a day. Recommendations c, d and e should be required. All of the recommendations in the draft code should be required. Sick and injured birds are the most at-risk and require that any and all steps be taken to ensure their suffering is minimized. Birds should always be carried upright and never more than two at a time. At minimum, the sentence in the draft code: “birds must not be carried solely by the head, neck, one wing, or tail feather” should be amended to include “or by one leg”. All recommendations in the draft code should be required, b and e at minimum. This is an especially difficult section given the brutality inherent in “milking” toms and artificially inseminating hens. All recommendations should be requirements and the poultry industry must address the issue of genetic selection and choose breeds whose growth rates do not prohibit them from reproducing naturally. Recommendations a, j,k,l in the draft code should be required, as well as fly control. All mutilations should be forbidden as they are in the European standards, and should only be allowed if all efforts to prevent feather pecking and cannibalism have been exhausted. In the rare exceptions when they are carried out, painkillers must be provided. Controlled Moulting should be forbidden. Recommendation b in the draft code should be required. Wet birds have a high risk of freezing to death during transportation. The one recommendation in the draft code should be required. The one recommendation in the draft code should be required. Currently producers across Canada are withdrawing feed and water for between 3-5 days. This is egregiously cruel. All recommendations in the draft code should be requirements, and not holding birds by one leg should be stressed. In addition, it should be a requirement that birds must always be carried upright and never more than two at a time. All recommendations in the draft code should be required. All recommendations in the draft code should be required and text should also be included to explicitly state that common farm tools should not be used in an attempt to kill sick and injured birds (shovels or metal bars, for example). Manual Blunt Force Trauma should be prohibited on adult turkeys. It is ineffective and causes immense suffering. Decapitation should begin at the back of the neck to sever the spinal cord to render the animal insensitive as quickly as possible. Carbon Dioxide is not effective on young birds and should be prohibited on these birds at minimum. Cervical Crushing should not be allowed on any bird whether they are rendered unconscious prior to it or not.